Granted it’s only a knife but isn’t it pretty. My friend Brad thinks it’s very ‘Game of Thrones’ and asked if it stabbed well! I got this knife for Christmas from my mother-in-law. I was quite overwhelmed to receive it actually. I love these knifes but they are just stupid expensive. This is a 10 inch cooks knife and is very very sharp. It made short work of the shallots in the picture. This German knife is a Rhineland Carvery knife and they are so beautifully weighted. It even puts my Global knives to shame. The centre balance makes cutting things effortless. It’s beautiful to look at too – that wooden handle is a work of art. I have another. A meat cleaver which my mother-in-law picked up for me at the Ideal Home Exhibition last year. Flint and Flame have had a stand there for the last two years and I think they are the only UK supplier. They are very much something you get in the USA – but I’d be surprised it they could be shipped! Anyway – if you can afford them I thoroughly recommend them. 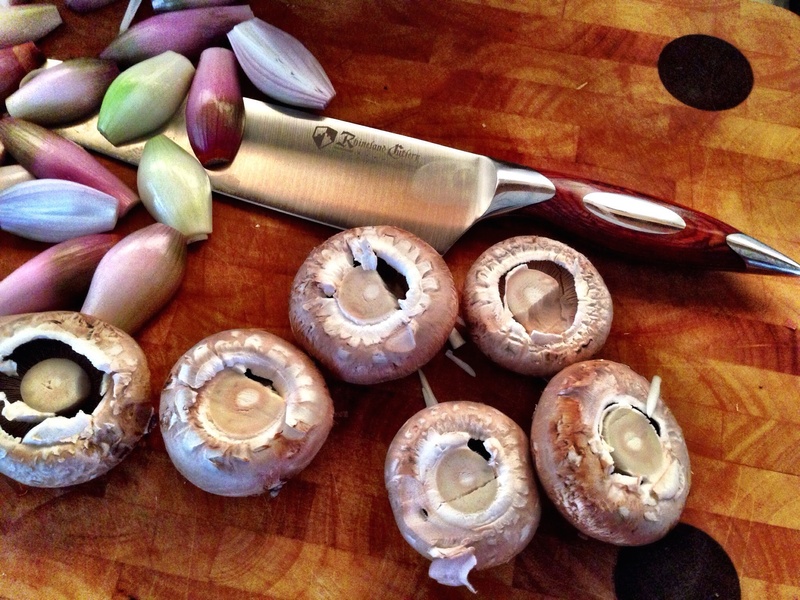 The shallots and mushrooms in this picture are for an oven baked shallot and mushroom risotto. It’s cooking now – and it smells amazing. I hope it turns out well! This entry was posted in flint and flame, knives, rhineland carvery and tagged flint and flame, knives, rhineland carvery by tenuoustoaster. Bookmark the permalink.